This book offers a fresh approach to Hawthorne and O’Connor as writers of the American romance. Drawing from a contemporary philosophical context, it applies Gadamer’s cultural critique of modernity to the moral and artistic visions conveyed through the authors’ use of the literary form of romance. Hawthorne defines the romance form in terms of its freedom from the realism demanded by the novel. The writer of romance creates a neutral territory between the actual and imaginary, inner and outer reality. The world of the romance is therefore one of the author’s own making, freed from the constraints of objective reality. 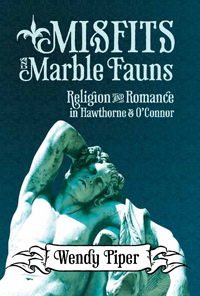 O’Connor adopts Hawthorne’s romance in her own use of the grotesque and for a similar ethical purpose. As a Catholic Christian, she distorts the real in order to reveal the mystery that surrounds existence. O’Connor’s secular reformers, liberal intellectuals, and nihilists attempt to manipulate the world of matter in order to improve or remake the world to their own liking. Like Hawthorne’s characters, they are confronted by the mystery of the romance to be recalled to the reality of their own finitude. In the field of hermeneutics, Gadamer makes claims that are pertinent to the narratives of Hawthorne and O’Connor. Against the dualism of modern method, he conceives of knowledge as a “fusion of horizons.” This dialogic nature of knowledge calls into question the prevailing scientism of post-Enlightenment modernity. Like the fiction writers, he asserts the mystery of aesthetic experience against the will-to-power that, he argues, is characteristic of modern method. A splendid study. Wendy Piper has produced one of the most compelling readings of Flannery O'Connor by showing, as no one else has, her deep roots in Hawthorne's generic originality of the romance. With Piper's superb precise insights into both the Hawthorne and the O'Connor canons, Piper goes further; she enlarges her interpretation by incorporating the hermeneutical method of the great 20th century German philosopher, Hans-Georg Gadamer. She defies the "scientism" that describes so many current interpretations of both Romance-writers. Gadamer's "fusion of horizons" and theory of knowledge as dialogic reveal, in Piper's analysis, an ongoing method of reading romance as a place of freedom for the art of both masters. There the fiction of both opens up for that act of contemplation O'Connor sees as the opening to the mystery at the heart of every good story. However rising from particulars, such fiction for O'Connor ends in a dialectical freedom, a whole greater than its parts and not to limited by them. In its way, Piper's study is sturdy milestone pointing the way.